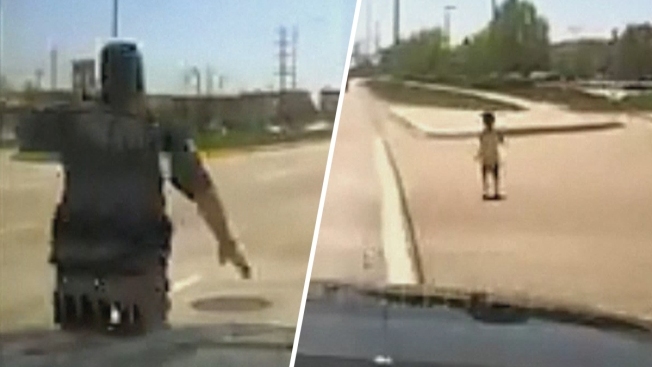 Police released footage from the dashboard of a police cruiser as an officer pulls over and snatches up a rogue toddler veering dangerously close to traffic in suburban Chicago. Naperville Sgt. Anthony Mannino performed the rescue last month, the department said in a Facebook post on Monday. Mannino found the boy after he “escaped his mother’s watchful eye,” police said. The youngster was running along Route 59. “Thirty-one, trying to corral a 1-year-old boy running across 59 just north of North Aurora,” Mannino is heard saying into his radio in the video. As the squad car comes to a stop, Mannino is heard shouting “hey, hey, hey!” at the child darting along the road next to a truck carrying a bright red sedan in its bed. The police sergeant sprints toward the little boy and calms him down. “You’re OK, you’re OK,” he tells the boy, before asking him his name. He then picks the child up and walks him back his cruiser. “Luckily, no one was hurt, and we attribute that to Sgt. Mannino's observation while on patrol and quick reaction, placing his squad car and himself between the child and traffic,” the department said on Facebook. The child was reunited with his mother and there were no charges, The Associated Press reported. Mannino was given the department’s Life Saving Award on June 7. “Well done, sergeant,” the post reads.